It should go without saying that winning a USGA national championship is no easy task. And that’s even more the case for a resident of Colorado, where the population isn’t huge — relatively speaking — and trying to play golf year-around can be problematic. All that said, when lifelong Coloradan Bill Loeffler was departing for the U.S. Mid-Amateur in the fall of 1986, his father-in-law, Ron Moore, made a bold prediction. And, sure enough, Moore proved prescient regarding Loeffler, now a member of the Colorado Golf Hall of Fame, like Moore. 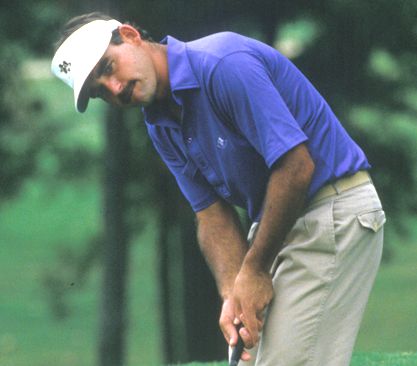 Loeffler, then 30, would go on to win the 1986 U.S. Mid-Am, which drew 2,511 entrants. The event was played at Annandale Golf Club in Madison, Miss., a Jack Nicklaus-designed course that hosted a PGA Tour event for 20 years until 2014. Loeffler defeated Georgian Charles Pinkard 4 and 3 in the scheduled 18-hole championship match on Oct. 9, 1986. Loeffler (above in a USGA photo from the ’86 championship) remains the only Coloradan to have won the U.S. Mid-Am, which dates back to 1981. As much as Loeffler has accomplished in the game — he’s also won three Colorado Opens (tied for second-most ever, behind Dave Hill), the 1992 national PGA Assistant Professional Championship, the 2007 Senior PGA Professional National Championship, a Colorado Senior Open, a CGA Amateur and three Colorado PGA Section Champioships — he points to the 1986 U.S. Mid-Am victory as the most meaningful in his long career. “It’s probably the best accomplishment I can think of — only because of what the Mid-Am did for me,” said Loeffler, now 62. “Not only was it a USGA championship, but it got me on the Walker Cup team (in 1987) and then into the Masters (in 1988). It was a springboard. Anytime a golfer gets a chance to win a USGA event, it’s a pretty big deal. I can’t think of anything bigger” that he’s accomplished in golf. Indeed, though the U.S. Mid-Am victory didn’t automatically earn him a spot on the Walker Cup team or into the Masters back then, that was the de facto result of his victory in Mississippi. Coloradan M.J. Mastalir, then a member of the USGA Executive Committee, pushed for Loeffler’s inclusion on the 10-man Walker Cup team, and Loeffler ended up going 2-1 individually as the U.S. routed Great Britain & Ireland in the matches in England. And at the time, the Masters invited the entire U.S. Walker Cup team into its field, which is how Loeffler competed at Augusta National in 1988. In the department of fortuitous timing, that was the last time an entire American Walker Cup team was invited to the Masters. On the other hand, since 1988 every U.S. Mid-Am winner has been invited to the Masters, and since 2017, the Mid-Am champ has landed a spot in the following year’s U.S. Open. At the ’86 Mid-Am, Loeffler rode a very hot Ping putter to the title. Besides defeating Pinkard in the final, Loeffler topped one of the world’s top amateurs at the time, Randy Sonnier, 3 and 2 in the semis. 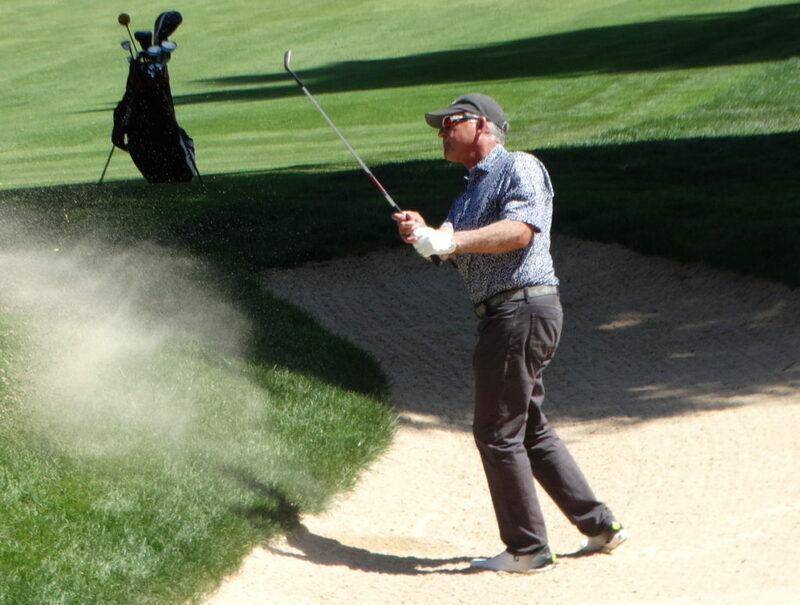 Sonnier was a finalist — losing to Jay Sigel — and a stroke-play co-medalist the only previous time the U.S. Mid-Am has been contested in Colorado, in 1983 at Cherry Hills Country Club. Asked specifically about the final against Pinkard, Loeffler (left in a USGA photo) said he has few specific recollections. Loeffler’s 4 and 3 victory ties for the second-most-lopsided margin in an 18-hole U.S. Mid-Am final. He only had to play the 18th hole once in the match-play portion of the event. And at 30, he was the event’s youngest champion at the time. Loeffler knew something special might be in the works during the practice days — specifically when he got into a putting contest on the practice putting green with fellow former Arizona State University golfer Dennis Saunders. In fact, that Ping putter worked so well that week that the manufacturer — as has been the case since the 1970s for each major victory with a Ping putter — made a gold-plated putter with the exact specs of the one used to win the tournament and stored in a company vault at Ping headquarters in the Phoenix area. While his putting was spot on that week, Loeffler had to manufacture a tee-to-green game to a certain extent. Even after winning the national title, Loeffler was frustrated with that situation to the point that he rectified it within a few days of returning to Colorado. “When I got home from the championship, I went down to Castle Pines into their club room and decided I didn’t like the shafts in my irons so I reshafted all of them,” he said. “I was so mad I couldn’t turn the ball over. I figured it had to be the shafts; it couldn’t be me. It was just impetuous and stupid. Loeffler’s golf career has been an unusual one given that he’s gone from amateur to pro to amateur to pro. After winning a state high school title at Cherry Creek, a CGA Junior Match Play and CGA Amateur in Colorado before becoming an All-American at ASU, Loeffler turned pro the first time and made it to the PGA Tour. He competed on golf’s top circuit in 1980, ’81 and early ’82, playing in 32 events. But he made only eight cuts and $5,356 during that time. So even though he had some PGA Tour status remaining in 1982, he decided after playing poorly in U.S. Open qualifying that he’d start the process for regaining his amateur status. Three years later, he was an amateur again and played in the CGA Match Play — where he lost to eventual champion, and now longtime PGA Tour/PGA Tour Champions player, Brandt Jobe — and in the CGA Amateur. In 1986, Loeffler won the U.S. Mid-Am, then captured the inaugural CGA Mid-Amateur title and a third Broadmoor Men’s Invitation victory the next year. But after playing on the ’87 Walker Cup team and in the ’88 Masters as an amateur — where he shot 77-79 and missed the 36-hole cut — Loeffler returned to the professional ranks in 1989, this time on the club professional side of things. During this second stint as a pro — which has lasted the last 30 years — Loeffler has been an owner of The Links Golf Course in Highlands Ranch and Moore, Loeffler, wife Sandy and their family built and operated the Hale Irwin-designed Highlands Ranch Golf Club from its opening in 1998 until 2011, when it was gifted to the University of Denver. And obviously Loeffler has accomplished plenty as a competitor. But Loeffler (left in a CGA photo in 2018) has been hampered by a bad back for quite a while now, to the point that he believes his days of competing in multi-day tournaments may be behind him. But Loeffler still enjoys rounds of casual golf with wife Sandy, who has taken up the game, and friends. And if his days competing in major events is indeed done, Loeffler has put together a stellar resume, including the 1986 U.S. Mid-Am title. And he’s happy to see the event returning to his home state this year.